Text: In the evening, I went to the new Theatre, to see Mrs. Cowley’s Play, “Every One has his Fault,” with the Farce of “No Song No Supper.” Mrs. Whitlock, sister to Mrs. Siddons, is the chief actress; and, to my surprise, I recognized Darley, one of our actors, last winter at Salisbury, in the character of Crop. It is an elegant and convenient theatre, as large as that of Covent Garden; and, to judge from the dress and appearance of the company around me, and the actors and scenery, I should have thought I had still been in England. The ladies wore the small bonnets of the same fashion as those I saw when I left England; some of chequered straw, &c. some with their hair full dressed, without caps, as with us, and very few in the French style. The younger ladies with their hair flowing in ringlets on their shoulders. The gentlemen with round hats, their coats with high collars, and cut quite in the English fashion, and many in silk striped coats. The scenery of the stage excellent, particularly a view on the Skuylkill [i.e. Schuylkill River], about two miles from the city. The greatest part of the scenes, however, belonged once to Lord Barrymore’s Theatre, at Wargrave. The motto over the stage is novel:— “The Eagle suffers little Birds to sing.” Thereby hangs a tale. When it was in contemplation to build this Theatre, it was strongly opposed by the Quakers, who used all their influence with Congress to prevent it, as tending to corrupt the manners of the people, and encrease too much the love of pleasure. It was, however, at length carried, and this motto from Shakespear was chosen. It is applicable in another sense; for the State House, where Congress sits, is directly opposite to it, both being in Chesnut-street, and both houses are often performing at the same time. Yet the Eagle (the emblem adopted by the American government) is no ways interrupted by the chattering of these mock birds with their mimic Tones. Comments: Henry Wansey (1752?-1827) was an English antiquarian and traveller. 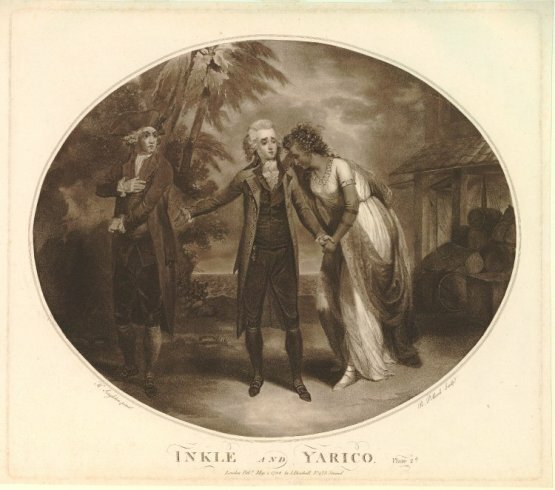 In 1794 he visited the United States of America and two years later published an account of his travels, including meeting President George Washington. The play he saw at the Chestnut Street Theatre (aka The New Theatre), Every One Has His Fault, was written by Elizabeth Inchbald, not Hannah Cowley, while the operatic afterpiece No Song No Supper had music by Stephen Storace and a libretto by Prince Hoare. The lead actress was Elizabeth Whitlock, sister to Sarah Siddons. Philadelphia acted as the temporary capital of the United States, 1790–1800, while Washington D.C. was under construction. “The Eagle suffers little Birds to sing” comes from Titus Andronicus.